This is the place to find information and download resources that will make your CHIditarod fun, easier, and save you some registration headaches on race day. Check back closer to race day for all the updated documents you’ll need. Fulton Market will be closed entirely between Ashland Ave and Justine Ave. During the start of the race, at 12:30, traffic on Ashland Ave will be stopped briefly by the Chicago Police Department to ensure the safety of all of our participants. Team drop-off must occur at the corner of Fulton Market and Justine. 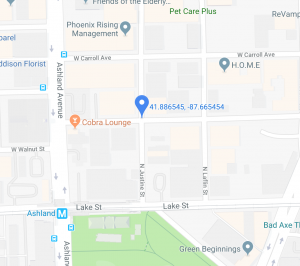 The exact address is 1532 W Fulton Market. Approach the event from the North on Justine. Do not approach the event from Ashland or from the West on Fulton Market. These streets will be closed to traffic. We will have them on-site, but you can impress us with your advance preparation by printing and signing 5 of these in advance, then bring them to registration. Everyone on your team needs to sign one. Here is the handout from the mandatory team orientation meeting prior to the race. 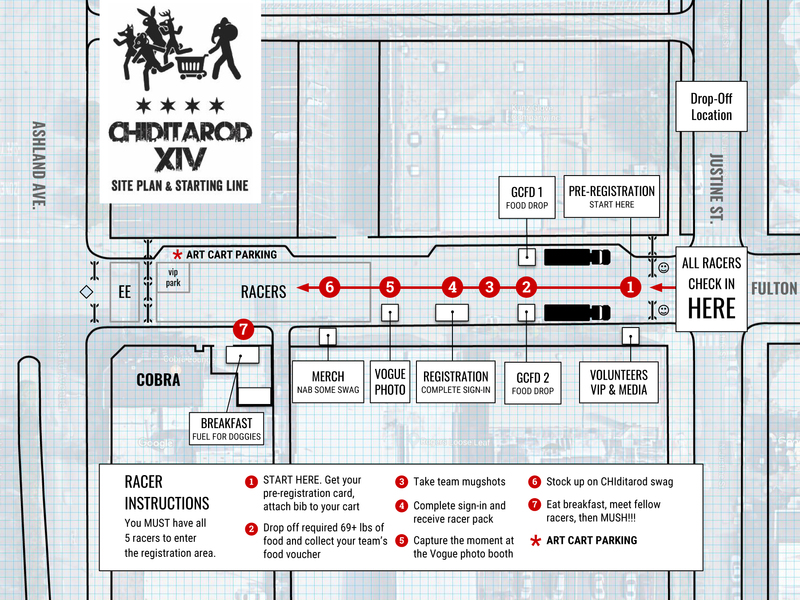 This is an excellent synopsis, and reminder, of what to do and not do at CHIditarod. Download the 2019 team bib numbers here. Please make sure you look this up before arriving at the Yard. Learn all about the starting line, including where to go to check-in. Click here to download. This is a general map. Racing teams will receive a customized route map on race day which provides their specific route order. Give this map to your friends and supporters! Yes, you can totally leave your cart at the finish line and head over to the award ceremony. PARTY ON. However, if you plan to pick your cart up on race day you will need to do so by 10 pm. You also may leave your cart in the yard overnight at your own risk. If you choose to this, you must pick up your cart between 12 and 2 SHARP on the day after the race (Sunday). You must send us a picture of your cart returned to its natural habitat with the cart refund card to get your deposit back. If you LOST/MISPLACED/THREW OUT your cart refund card – for SHAME. We told you at registration how important your racer packet was and that if you lost it you were royally #*$&@^. Ok, ok, we will help you redeem yourself. To receive your cart deposit back, take a picture of your cart with with a daily newspaper dated after race day. You can be in the photo too, creativity encouraged. This is to prove you returned your cart to its native habitat, or even better, that it’s in your vehicle or nestled all snug in your living room. Send photos to cartvixen@chiditarod.org. Include team name, captain’s email address, and your name. Deadline: the stroke of midnight on the Saturday after CHIditarod, March 9th, 2019. Leave No Trace: you are not allowed to dismantle, remove decorations, clean out your cart in The Yard. You must take home all your decorations, cart, garbage etc and dismantle at home. If you use the dumpsters you will forfeit your cart deposit. No exceptions. Not kidding.